Learn how to make an Easter bread recipe. These can be very delicious and also can make a beautiful presentation. If I was asked to select one type of food that is to symbolize the Easter season around the world, it would have to be bread recipes. If you learn how to make an Easter bread recipe, you will find the most popular to be the Hot cross buns (or rolls). The cross on the buns symbolize the cross on which Jesus died. However important this recipe is, there has been a great deal of controversy over it but it always arises more popular than ever. Not only do the rolls have significant Christian value but they are also very delicious. 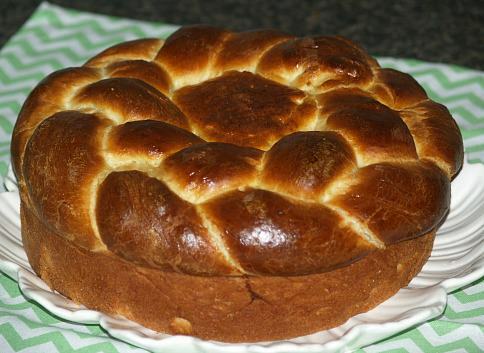 As you are learning how to make an Easter bread recipe, you will find the braided egg bread is also a favorite in many countries. The texture of this yeast bread is very good. Before placing in the oven several eggs colored with food coloring and are tucked in the braids on top of the loaf; as the bread bakes so do the eggs. This bread makes a great presentation on the table. The eggs symbolize rebirth; no other explanation is needed for this recipe. I make several bread recipes during the Easter Holidays this may be why my French toast recipe is my traditional Easter breakfast. I always include French toast along with hot cross buns, an Easter bread recipe and quiche Lorraine in my Easter brunch. In a large bowl combine the 1 cup of flour, sugar, salt and yeast; stir to blend; add the soft butter to top of mixture but do not blend. Heat water, lemon juice and grated rind until warm; gradually add to butter and dry mixture, stirring constantly to blend.Add beaten eggs and ½ cup of flour; beat well to blend. Gradually add remaining flour mixing well after each addition. When dough forms a ball turn out on a floured board and knead until smooth. Put dough into a greased bowl turning to grease dough ball. Cover and let rise until double in a warm place. Punch dough down and divide into thirds. With hands shape each piece into a long rope 30 inches long. On a greased cookie sheet, loosely braid the three ropes and make into a circle pressing the ends together. Gently spread dough apart with your fingers at even intervals and tuck eggs into the dough. Cover and let rise again until about double. Gently brush loaf with melted butter and bake for 35 to 40 minutes or until loaf is golden brown. A Greek bread recipe called Tsoureki recipe is a very popular Easter bread recipe. This brioche like bread is made rich by cream and butter along with the other typical yeast bread ingredients. This sweet bread is soft and moist but chewy. 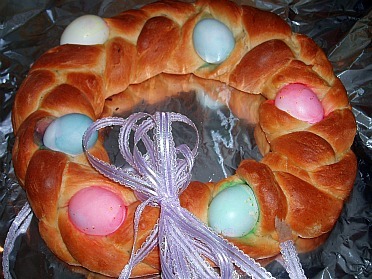 This bread also is decorated with colored eggs symbolizing rebirth at Easter time. Add milk, butter, eggs, egg yolk, sugar, anise and salt; blend thoroughly. Add flour gradually beating until smooth. Turn dough out onto a floured surface and knead until dough is smooth and elastic; about 10 minutes. Cover and let rise in warm place about 2 hours or until doubled in bulk. Punch down dough and knead on floured surface into a smooth ball. Cut off 4 pieces of dough each the size of an egg. Place remaining dough in a greased 10 inch round cake pan. Shape small pieces of dough in ropes and twist to about 4 ½ inches long. Arrange ropes ends together at center of bread and loops opening out to edge of bread. 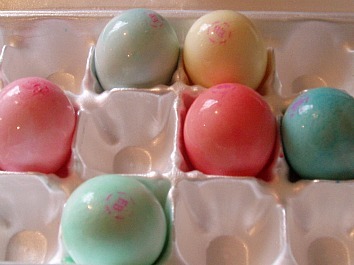 NOTE: loops should be able to hold colored eggs. Brush loaf lightly with beaten egg white; sprinkle with sesame seeds. Cover loaf lightly and let rise in warm place until double in bulk about 1 ½ hours. Carefully place 1 red colored egg in center of loaf and 1 colored egg in each of 4 rope loops. Bake in preheated oven at 375F degrees for 30 minutes or until pick comes out clean. From the Eastern European countries we get the Paska bread recipe. Immigrants from these countries brought this Easter bread recipe to the United States; now it is a favorite among many of us. Like some of the other Easter bread recipes this yeast bread includes eggs, butter and cream along with the typical bread ingredients. Sometimes the inside of this bread is a swirl of yellow and white, it might have maraschino cherries in it or raisins; all having symbolic reasoning behind each. NOTE: This Easter bread recipe has a " cake like" texture with a great dark tender flaky crust. Combine yeast with warm water until dissolved. Blend in milk, salt and grated lemon peel. Turn dough out onto a floured surface; knead until smooth. 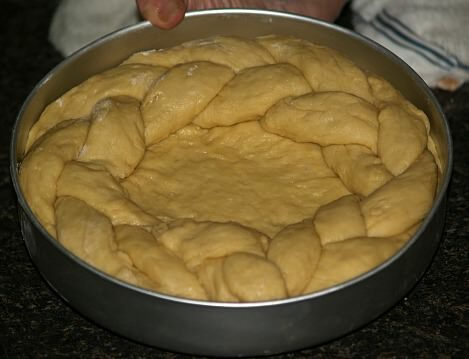 Place dough in a large oiled bowl; cover and let rise about one hour. 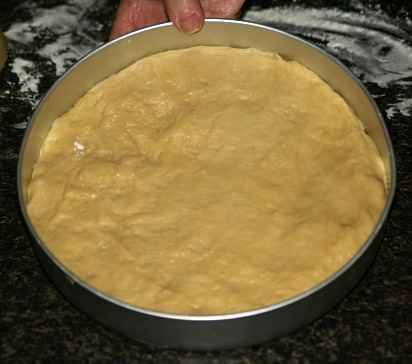 Punch down and divide dough into half; place 1 half in a 10 inch round greased spring form pan. Using remaining half, shape 3 ropes; braid the ropes together and place on top of dough in pan. Cover and let rise until double in bulk; 1 hour to 1 ½ hours. Mix beaten egg with 1 tablespoon water; brush bread lightly with mixture. Continue baking until pick inserted in the middle comes out clean. Many countries enjoy a stolen recipe as their Easter bread recipe, for Christmas or anytime of the year. This yeast bread is made with various types of fruit, almost like a fruitcake. It was very popular with my ancestors from Germany and we almost always had this type of fruit bread at the holidays. After baking it can be dusted with powdered sugar, frosted or glazed. Dissolve yeast in warm water in large mixing bowl; let stand 5 minutes. Add sugar, salt, eggs, egg yolk, ½ cup butter and 1 ¾ cups flour; beat on medium speed 10 minutes. Stir in remaining 1 ¾ cups flour, chopped almonds, ½ cup candied fruit and raisins. Cover and let rise in warm place (85F degrees) for 2 hours; will NOT double in bulk. Stir batter and refrigerate for at least 8 hours. Turn dough out onto lightly floured surface and coat with flour. Divide dough in half and shape each half in a 7 X 10 inch oval; spread each with softened butter. Fold each buttered oval in half lengthwise firmly pressing folded edge. Bake in preheated oven at 375F degrees for 20 minutes or until golden brown. Combine powdered sugar and hot water; blend well. Drizzle over each loaf; garnish with almonds and candied fruit.